The Scarlet Macaw is a large and colorful type of a parrot, inhabiting the regions of Central and South America. It is native to the regions in the humid evergreen forests in the tropical regions of America. It is an endangered species, and has suffered local extinction in many places, due to habitat destruction and capture for parrot trade. 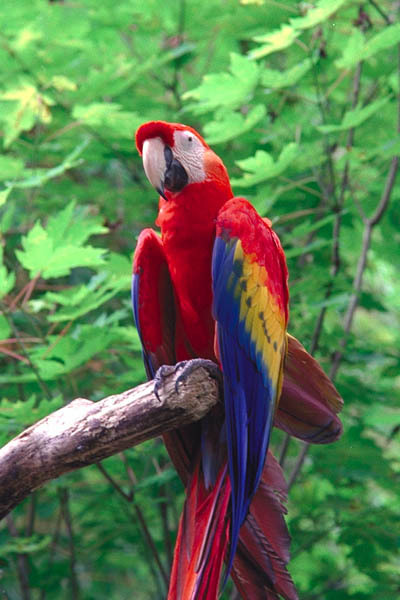 The Scarlet Macaw is the National bird of the Honduras. It is one of the largest birds in the New World. They can be tamed easily, nd like other parrots, can be successfully trained to imitate human voice. The Scarlet Macaw is listed as an endangered animal due to their dwindling number, the reasons behind this being – loss of habitat, their capture as pests and destruction of their habitat. There is a heavy exploitation of this bird for the sake of pet trade. These wonderful birds are facing numerous threats to their lives. A typical scarlet Macaw is 32 inches long. The wings measure about 36 inches. Scarlet Macaw has a graduated tail, which is longer than the other macaws. 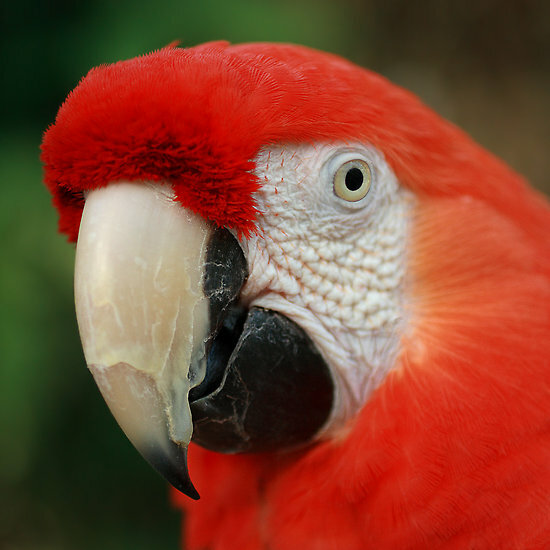 The average weight of a scarlet macaw is about 2.2lb (1 kilogram). Its general plumage is bright scarlet. Its bill is striking black and white in color, and has pale naked cheeks. The wings are blue, and have yellow and green markings on them. The coverts of the upper wings are yellow in color, while the flight feathers are dark blue. The underside of the wing and tail is dark red in color, and has a metallic gold iridescence. There are three subspecies of the scarlet macaw which present varying widths in their wing band. The skin around the eye is bare white. Some very tiny feather is contained in the face patch. The lower mandible is black in color, and the upper one is pale horn. There is only one difference between the young scarlet and an aged macaw. 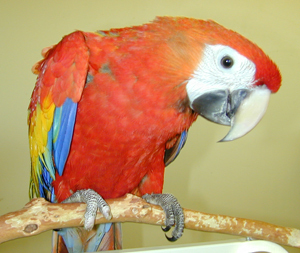 The young macaw has dark eyes, while the old ones have hollow light eyes. They are relatively hairless, medial facial, and the facial patch is less in some macaws, while the facial patch s smaller in some species, it is limited to a yellow patch in the others. Scarlet macaws have distinct facial feathers which are as unique as human fingerprints. These birds prefer to spend time in tall and deciduous trees in the forests, near rivers. They stay in large and noisy groups. This bird can be found in Southern Mexico to Peru. It is also found in Bolivia, Eastern Brazil and Trinidad. They primarily originate in the humid lowland rain forests of the subtropical region, in the woodlands and savannas of the central and South America. The habitat of scarlet macaw is such that it is considered to be of the greatest latitudinal range for any kind of bird. It has the territorial range of 6,700.000km2. But even though they have an extensive territorial area, their habitat is fragmented and small colonies of these birds are confined to tiny populations, which are scattered throughout the South and Central America. But even then, they are found in large numbers in some parts of the territory, where they are known as “common”. 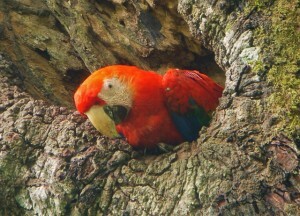 The Scarlet Macaw is now decreasing in population, but before this, they inhabited a lot of regions in Costa Rica. Their population is decreasing sue to poaching, habitat destruction, and deforestation. Scarlet Macaws eat a lot. So this is a very important consideration that should be kept in mind before bringing them to your house for taming them. Scarlet Macaws need a varied diet with lots of fruits and vegetables to survive. They feed on fresh fruits, nuts, and seeds, even the large and hard seeds. They eat pecans, almonds, macadamias, Brazil. They also feed on hot peppers of different colors. You can see a typical sighting of a pair of this bird flying above the forest canopy. Apart from nuts and fruits, they also feed on buds and nectar. They are very fond of sweet tasting fruits like mango, melons, grapes, bananas, cranberries, pomegranates, figs, etc. Among vegetables, they prefer dark leafy green vegetables and root cooked vegetables such as sweet potatoes, turnips, yams and carrots. They may be fed apples and corn occasionally, as treat. Lots of milk products are not generally recommended for them, though they may indulge into them occasionally. It takes a lot of time to make sure that the Macaws are healthy and string. Some of them can be very picky, and can be choosy in terms of selecting and liking a particular food item. Their food should be presented to them in an attractive way, which may be sliced or cooked. Scarlet Macaws mate for life. They nest from January to April in the holes of the canopy of dead trees. The adults lay two or three eggs in the cavity of trees. The eggs are incubated by the females for at least five weeks, and the chicks are fledged from the nest 90 days after the eggs are hatched. The eggs are hatched after 25 days approximately. The young chicks leave their parents after a year or so. The mated adults preen each other and their offsprings for many hours, and also clean the bugs from their feathers. Scarlet Macaws are adapted to crush their fod, and they also ave an additional limb, which they use for climbing. Against the skull, they have their bill hinged, with the help of which they move independently. This increases the strength and flexibility of the birds. Scarlet macaws often form large groups as they are gregarious birds. Their communicate with each other by making calls that ranges from squawks to piercing shrieks. They are also expert in imitating human sounds. This bird requires special consideration. It is a large bird, and before you think of taming it, tou should be wasre that it is a large bird. It also needs a lot of space to move about, to climb, to forage and so forth. They have a very powerful beak, so their cages should be durable and made up of stainless steel. Scarlet macaws have a typical lifespan of 30 to 40 years. However, in captivity, they can live for even 50 years. Scarlet Macaws have a very strong beak so that they can crush the nuts and seeds. They even pinch their predators with their beak. Scarlet Macaws also have very sharp talons so as to grab hold of the branches. They have a well-known ability of imitating human sounds. They have an additional limb for climbing. They use various sounds for communication, such as shrieking and squawking. Scarlet macaw is very popular as a pet due to its extremely attractive appearance and vivid color. It has very interesting vocal capabilities due to which people get attracted towards it. Though they are tameable, yet they do provide some difficulty to the owners. They are also famous for producing a large amount of mess and also noise when they are not raised properly. They are very strong and quite capable of aggression, so individuals are cautioned against inserting fingers into the cages of the birds which are not familiar. Want to know how Scarlet Macaw looks like? Here are some useful Scarlet Macaw images for you. 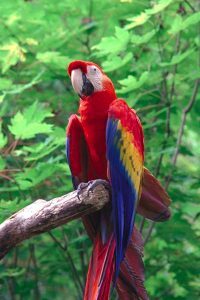 Check out these Scarlet Macaw photos and know about the physical appearance of this beautiful parrot.